Enjoy ice cream, save the planet. To celebrate the World Environment Day, urban people can get started doing something different for saving the earth. On a hot day in Bangkok, ice cream lovers and many people might know an ice cream cart like “Phaithooang” (ไผ่ทอง). 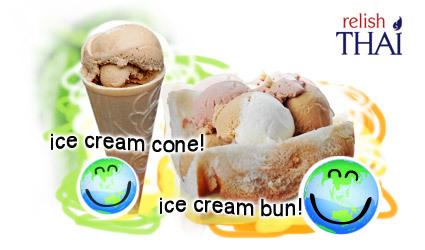 How can you help our earth and enjoy your ice cream? Street ice cream cart such as Phaithooang provides you four choices of ice cream containers; a bun, a cone, a plastic cup and a foam container. The easy way to save our earth is to pick a cone (5 baht) or a bun (10 baht) for your choice of ice cream container and stop using a plastic cup or a foam container with a plastic spoon. Is that easy saving our planet? Just get started by this and if you have time to grow some plants, that will be wonderful.